It's 8:36am (it's now 1:48pm and I'm just finishing this) and I've been up for over an hour. It's not even that bad, I know, but I'm not a morning person whatsoever. I set my alarm for 30 minutes before I actually have to get up but that plan never seems to stick. So, that leaves me with 1 single reason why I'm up this early....Biology. Yes, school started this week so it's back to reality. Today I have a two hour Biology lecture that I'm not so excited about. In the meantime, let's get to some Five on Friday to make the day a little brighter! Now that the holiday's are over and my birthday has gone, we've started eating healthier and are exercising more. Our schedules always seem to get in the way. Although that's not really an excuse, we can't exactly spend any time outside so we've settled on a 1 mile walk On Demand after dinner when we are all together. It's so much fun and the girl that instructs it mixes it up so we get the best workout possible! We've also gotten lucky and have found some really awesome lower fatty snacks that we love but normally have too many calories. Amazing popcorn! A perfect combo of butter/sea salt yet still only 39 calories per cup. We found it at Sam's Club if you have one near you! Leave it to Trader Joe's to come up with the best alternative! Our weather has been crazy this week. Last Saturday we got a big snow storm. We were only supposed to get 1-2 inches but got so much more that my dad was able to snow blow a few times. The roads were terrible with SO many accidents and spin outs. It was so so pretty though because all the snow stuck to the trees for about a day! Two days ago we were supposed to get about 4-5 inches and got a busting...go figure! As I mentioned above school started on Wednesday. I'm taking two classes: Biology and Social Psychology. I know I will love Psych but am a little nervous about Biology. I have no taken a science class since Sophomore year of high school so I'm a little rusty and now the work load will be heavier then it was back then. We have a 3 hour lab on Wednesdays which should be interesting. I have a Bio lecture Friday mornings which is only an hour and 50 minutes but on Wednesdays I'm there from 10:45am-8:30pm. Crazy day! Thankfully we have a lunch break! I'm LOVING my new planner too! I've haven't posted a picture of this little rascal lately. He's been enjoying every ounce of sun we've been getting. He found the only piece of sun at the time. my parents have been wanting me to get a winter coat for awhile. I've worn coats int he past but am not a big fan of them. I feel like I can't really move around. Which is why I usually just settle on wearing a sweatshirt. They said it was going to be a birthday gift, so finally I agree to go look. I told them though that I would like a vest instead. That way I'm a little warmer but I can move around and wear a nice shirt underneath. My mom and I found a very nice one at L.L Bean yesterday and bought it. From the website. I love the color! 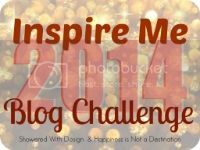 It's also time for another day of the Inspire Me 2014 Challenge! Friday January 24: Share some new trends/makeup/online shops you've found recently and include a few photos! Link up with Lisa and I and go explore!